CP Rail has no plans to partner with the city for a separated crossing on Harris Road. Canadian Pacific Railway assured the City of Pitt Meadows on Tuesday that there were ample emergency measures in place to prevent a deadly disaster, such as the one in Lac Megantic, Que. Detailing the company’s plans and frequency of inspections, Rick Poznikoff, CP’s senior manager of community relations, stressed safety was a top priority for the company. He told council that tracks leading into and out of Pitt Meadows are visually checked weekly and every six weeks with an ultrasonic device. Locomotives and train cars are inspected frequently and the transport of dangerous goods is highly controlled. “We are the safest railway in North America,” said Poznikoff, as he outlined the steps the railway takes to ensure trains roll safely through the city. He noted rail Hazmat accident rates are down 91 percent since 1980. Other statistics show accidents have dropped 38 percent since 2000. “But like any mode of transportation, things do happen,” said Poznikoff. The call to meet with CP officials comes three months after a runaway train carrying crude oil destroyed much of the Quebec town of Lac Megantic. Pitt Meadows requested to meet with the company after hearing from concerned residents. 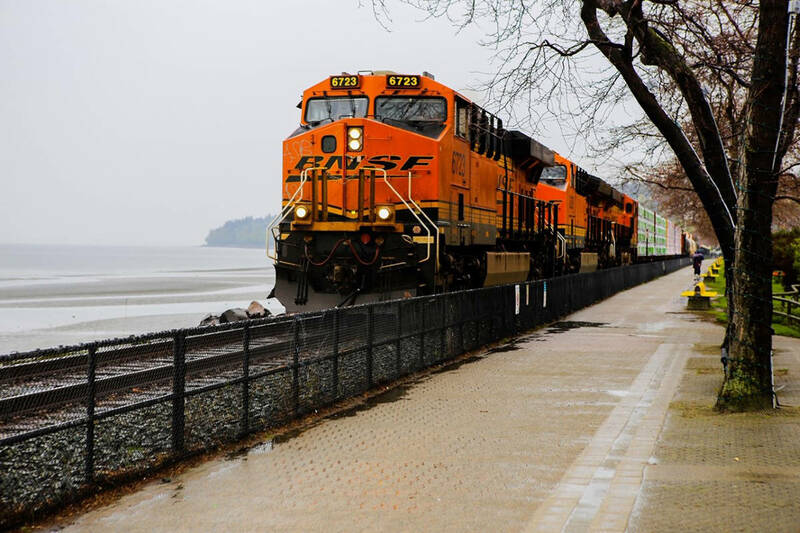 CPR’s 22,500-kilometre (14,000-mile) network extends from the Port of Vancouver in Canada’s west to The Port of Montreal in Canada’s east, and to the U.S. industrial centres of Chicago, Newark, Philadelphia, Washington, New York City and Buffalo. In Pitt Meadows, the company owns 83 hectares of land, 20 of which is an intermodal yard with the rest slated for possible expansion. CP told council it worked closely with both city staff and the fire department on a variety of concerns from working together on emergency planning to addressing trespassers and repairing holes in fences. Walters said CP’s presentation reassured council that the company has an extensive safety program in place that addresses tracks, cars and engines. She added the city will continue to meet with the railway quarterly to address rail-related issues, such as the speed of trains, train lengths and faulty crossings. A query about a separated crossing over the train tracks at Harris Road elicited a disappointing response from CP. The crossing remains a bottle neck and point of frustration for commuters. Walters said CP doesn’t plan to partner anytime soon for a crossing at Harris Rd.